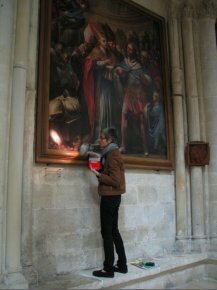 19/7/12 - Obituary - Chief curator for the Senlis museums, Bénédicte Pradié Ottinger passed away last 18 July after a long and painful illness. Born on 23 November 1961, she graduated from the Ecole du patrimoine in 1988 and started her career as a curator at the Musée des Beaux-Arts in Marseille. She arrived in Senlis in 1996 to take over as director of the city’s four museums : the Musée d’art et d’achéologie, the Musée de la vénerie [hunting], the Musée des Spahis and the Hôtel de Vermandois. Thanks to her initiative, first the Musée de la vénerie was renovated, then as of 2002, an extensive rehabilitation project for the Musée d’art et d’archélogie, housed in the former episcopal palace, next to the cathedral, was launched with funding from a private donor. The second is now almost finished and we will talk about it here in the next few days. The last stage, in the Renaissance gallery, previously closed to the public, should be completed this autumn. Bénédicte Pradié Ottinger had the joy of attending, last 23 June, the reopening of the renovated spaces to the public. We would like to make particular mention of her great courage on this occasion, which strongly impressed us. She was in hospice care at the time but insisted on answering our questions concerning the reopening which we had not yet seen. We exchanged several emails the preceding week in which she continued to demonstrate her great sense of wit while fully responding to our inquiries concerning a subject she was actively involved in despite being sick. Bénédicte Pradié Ottinger curated many exhibitions, notably Albert Guillaume in 1999 ; Thomas Couture, portrait d’une époque in 2003 (see article in French) ; Chasse à coure, chasse de cour, faste de la vénerie princière à Chantilly au temps des Condés et des Orléans - 1659-1910, in 2004, and more recently, Le cabinet d’un amateur : Georges de Lastic, 1927-1988 in collaboration with the Musée de la chasse et de la nature. A 19th century specialist, she became particularly interested in Thomas Couture (1815-1879), a native of Senlis, for whom she was writing the catalogue raisonné of his painted work. The chapel of the Chancelier Guérin, which Thomas Couture used as his studio in the early 1860’s, was entirely renovated and now presents the extensive collection of this painter’s works held by the museum, along with loans from other institutions. Several of the artist’s works were acquired under her leadership including most recently a beautiful Portrait of a Young Boy. The catalogue raisonné, already well underway, and for which we had published an advertisement last March, on our French site, will be completed and published by the Mare & Martin editing house.